One of the finest lots in the exclusive sonoran mountain ranch. 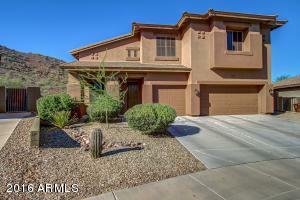 Peaceful living in your 5 bedroom, 3.5 bath cul-de-sac home, with open views of the tranquil sonoran desert. The kitchen features a large granite countertop sit-up island, high-end wolf stove, microwave, and built-in wall oven, custom cabinets, and walk-in pantry. The open concept blends into the family room complete with gas fireplace for those cool winter evenings. Master bedroom is located on the main floor with private entry to your backyard oasis. Large master bath and closet provide the space you've been longing for. The other 4 bedrooms, 2 baths, large game room/loft, and sitting area fill out the upstairs. A very happy home! Directions: Start From 67th ave and deer valley. From there, go North on 67th ave, becomes pyramid peak pkwy, then sonoran mountain ranch rd. Left on chalfen blvd, and left on 70th ln. Follow to left on peak view rd, and quick right on 70th ln. Home in cul-de-sac.